For Kuala Lumpur Revolutionaries, Call To Arms To Preview The Jaeger-LeCoultre SIHH 2013 Collection. NOTE: THIS IS NOT A PUBLIC INVITE, INIVITATION IS SUBJECT TO MY SMS OR WHATSAPP CONFIRMATION. 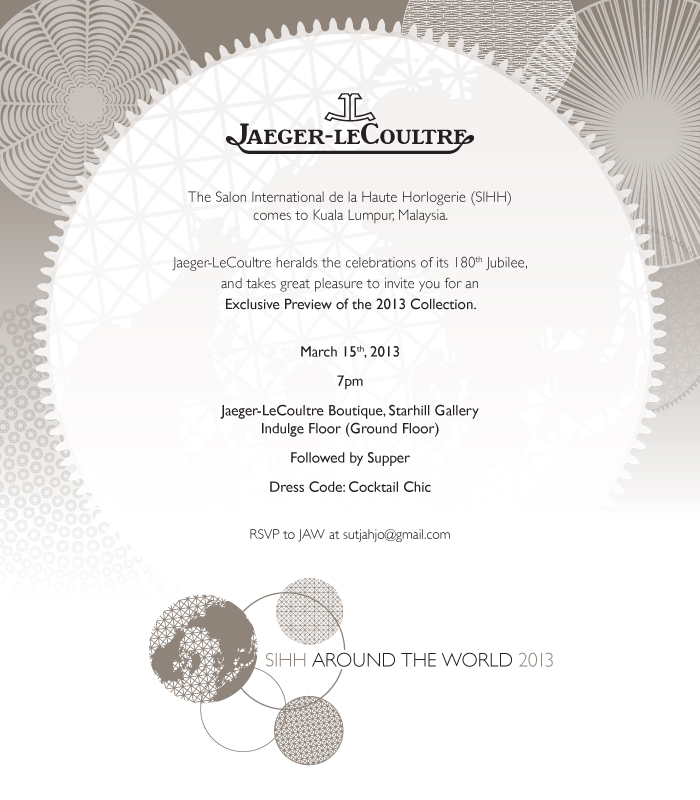 For those who are interested in the exciting Jaeger-LeCoultre SIHH-2013 collection, Jaeger-LeCoultre Malaysia has generously agreed to invite fellow Revolutionaries for an exclusive preview of the collection on the evening of 15th March 2013. Interested and committed members can email me at [email protected] with your full name and mobile number (for logistic and organisation purpose) and I will come back to you at the soonest possible time.